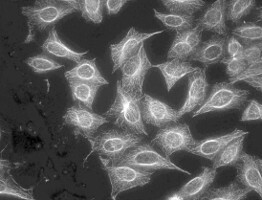 Use multi-parametric and high resolution imaging techniques to characterize and select innovative compounds and/or protein targets involved in cell division. Over the past few years, new strategies have emerged that allow one to discover new molecules on the basis of their activity in a given cellular context (cell-based assays), rather than at the molecular level. The most recent form of such strategies is the concept of image-based phenotypic screening or High Content Screening (HCS). The analysis of complex phenotypic changesinvolving multiple probes, multiple parameters computed from these probes, and multiple treatment conditionshelps to generate a new phenotype and/or new phenotypic profiles characteristic of the pharmacological effects and of the mechanism of action of a given molecule. The comparison of phenotypic profiles may then allow the discovery of molecules having unique mechanisms of action and/or that affect new targets. To get better results, high content phenotypic screenings require the use of advanced technologies adapted to the detection, quantification, and analysis of the observed changes. Ramis project partners are developing an innovative screening strategy based on high resolution imaging techniques to characterize phenotypes of new molecules and new targets interfering with the division of human tumor cells, in particular with mitosis. (c) a screening engine and a data driven search engine that compare and/or classify new phenotypes. Users of the Ramis software product will appreciate its ease of use and its capability to identify original molecules and/or targets. In addition, users can add new entries in the database and thereby enrich the knowledge of experts. When completed, Ramis will be a unique and efficient image-based, high content screening system for the identification of original molecules as well as new targets in the area of cell division. Develop other compound screenings dedicated to other essential cell functions such as cell death or DNA repair. The marketing and sale of the Ramis software will be the responsibility of ADCIS SA, a commercial partner in the Ramis consortium. The Research Institute Pierre Fabre (IRPF), located in Toulouse, France, is in charge of all R&D activities within the Pierre Fabre Laboratories. It brings to the project its expertise in the discovery of anti-cancerous agents in the field of onco-pharmacology. IRPF is also involved in automated image acquisition using fluorescence microscopy and in software development. The Centre National de la Recherche Scientifique (CNRS), a French public research center in Toulouse, brings its expertise in the field of fundamental cell biology and its comprehensive knowledge in the field of cell division and associated phenotypes. ARMINES, the research institute of the School of Mines ParisTech, brings its renowned expertise in the field of image processing and analysis to develop methods for quantitative description of cells, its experience in the field of data classification, and statistics. During the project, ARMINES will develop new techniques for the training and modeling of biological systems and phenotypes classification. ADCIS S.A., a commercial company located in Normandy, France, brings its expertise in the development of advanced software products for image processing and analysis. ADCIS is the prime contractor in the development of the Ramis software environment, the image database generation, the graphical user interface, the image annotation software to formalize the biology expert knowledge, and the integration of the various image processing and classification algorithms developed by the other Ramis partners. On April 20, 2007, Ramis received a formal approval from the Cancer-Bio-Health Cluster of the Midi-Pyrénées region. This project is currently funded by the General Directorate for Competitiveness, Industry and Services of the French Ministry for the Economy, Industry and Employment. Development work started on October 1, 2007.